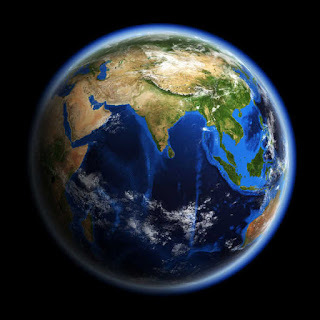 Home » Science » What Would Happen If The Earth Will Stop Spinning? What Would Happen If The Earth Will Stop Spinning? It could be possible that one day, billions of year from now, the earth will stand still. But chances are good that other event will occur before that such as the sun swallowing up the planet. With that being said there isn't a chance that the earth will suddenly stop spinning anytime soon. But let's just assume for a moment that the earth did suddenly stop rotating and take a look at what will happen to us and the planet. Our planet spins at its equator 1000 miles per hour as it orbits the sun, but as you get closer to the poles the rotation is slower. Without this rotation life as we know it wouldn't be possible. It is said that billions of years ago our planet used to spin much faster than it does now. At the beginning of our young solar system planet or large celestial body collided with the earth and in that collision, the Earth’s alignment and rotation were changed and the moon was formed. Since then the Earth’s rotation has been slowing down. It is said that the moon used to also spin faster than it does now before it becomes tidally locked with the earth. Tidal locking is the name given to the situation when a moon or planetary objects orbital period matches its rotational period. coincidentally it is the same fate that affects every single large moon orbiting a planet. A great example of this is our own moon. In our early solar system, both the earth and the moon rotated independently of each other. But the Earth's gravity grabbed onto the tidal bulges and slowed down the rotation of the moon. To compensate for the loss of momentum in the system the moon drifted away from the earth to its current position about 230000 miles away. But the moon has the same impact on the earth and those same tidal forces that caused that caused the tides on earth are slowing down the earth's rotation bit by bit and the moon is continuing to drift away a few centimetres a year to compensate. There are two different scenarios. Fast one if the earth just stopped spinning, but wasn't tidally locked to the sun. The planet would experience six months of sunlight and six months of darkness. But for the purpose of this mind experiment, let's take a look at the effects it would have on our planet to be tidally locked to our star the sun. First of all, we have to consider the speed of which our planet rotates at the equator. Which is roughly 1000 miles per hour a sudden pause would cause everything on the surface of the earth to suddenly move at a speed of over 1000 miles per hour or 1600 kilometres per hour in a sideways direction. Since the velocity needed to escape the earth gravity is over 24000800 miles per hour everything would stay tacked to the Earth's surface yet jolted forward. Imagine everything suddenly moving across the planet at 1000 miles per hour. It wouldn't matter what it was. Everything would experience a sideways declaration of three-quarters of the earth's gravity suddenly down would be at an angle of 38 degrees from vertical. The force of suddenly stopping would rip buildings right off their foundation and send them flying across the ground with anything else that isn't solid bedrock. Destroying everything in a giant and deadly debris path but that's not all. This would also include the oceans which would suddenly slosh sideways across the planet with waves being miles and miles high moving at the same velocity. Imagine Tsunami so high you couldn't see the top. Just a wall of water racing towards you at 1000 miles per hour. Both of these two calamities would be the end of most life as we know it. Although the earth would stop spinning the atmosphere would continue to spin at the earth's same velocity as well. Which would create very high winds and very nasty storms. Because the earth's rotational centrifugal force will force the planet to bulge along the equator with no rotation. You have no bulge and without that bulge, all of the extra water held in place along the equator would go rushing back towards the poles. If the earth stops spinning you have to take into consideration that the inner core of the earth is spinning at a faster rate. Just because the surface has slowed down doesn't mean the core of the earth has stopped too. Our highly volcanic planet might erupt in ways we never imagined as the tectonic forces above and below enter into a new conflict. Supervolcanoes would likely erupt across the entire planet. Second Scenario if the earth just stopped spinning, but tidally locked to the sun. Our tidally locked earth would have half of the planet always facing the sun and the other half would be in permanent darkness. Currently, our planet is in what is called a Goldilocks zone or habitable zone. Where it is the perfect distance from our sun in order to support life. There might still be placed on the earth where the climate would be habitable but on the two extreme sides, it might prove difficult for life to survive assuming that anything survived the previous catastrophes. If there were any appreciable amount of life left on the surface of the planet it would now have to survive in the twilight strip of land between the two halves. We are far enough away from our star that the part of the earth facing the sun wouldn't start to burn or turn to ashes overnight. However, the atmosphere on the hot side of the planet would start to erode some portion of the earth always. The part of the earth facing toward direct sunlight would receive more direct sunlight resulting in more heat and these high temperatures would cause strong rain and an increase of weathering. Normal weathering regulates the climates on the earth but now that you have one side of the planet hotter and another side cooler. On the hot side, atmospheric gases would build up and create even more heat this is called “the runaway greenhouse effect”. Clouds of gas could significantly increase the temperature so that the oceans would boil much like what has happened to Venus. The middle of the planet facing the sun on its equator or the substellar point would end up so hot. That almost nothing could survive. The cold side of the planet would have a different situation. The loss of the sun's heat on the dark side of the earth would turn the atmosphere into a dense gas. Then the condense into a liquid, and then further condense into solid ice. Of course, it is doubtful that the atmosphere on the dark side of the planet would turn into a solid form. Instead, it would keep condensing and creating a vacuum. Which would pull air from the hot side of the planet where the gases in the atmosphere would be expanding. With this happening it might be possible that the atmosphere would make the planet livable. But the storms that would come from this exchange of hot and cold air would be unimaginable. There would be superstorms on both sides of the planet with wind being strong enough to strip the very rock and he wrote it into the sand. The next thing that would likely happen is that the magnetic field of the earth would stop regenerating and slowly decay over time. This is because the magnetic field of the earth is generated by a dynamo effect that involves its rotation. Our magnetic field plays a huge role in keeping our atmosphere intact and this magnetic field also protects the earth from cosmic rays. Where would this leave humanity? We are very adaptable species that has seemed to survive other catastrophes. But even though we have powerful technology, being able to survive on a planet that has stopped spinning and is tidally locked to the sun would be a great challenge. We would be able to control our environment to a degree by moving underground but growing food in such conditions may be difficult. However, you shouldn't worry about this happening anytime soon as physicists have predicted it would be a billion years from now at the current rate. Also Read:- Why Hurricanes Are So Hard To Predict? How Does The Universe Will End? Why Hurricanes Are So Hard To Predict?